Twenty years ago last month, in a climactic ending to a remarkable season of high-scoring wins, BU came that close—hold your thumb and index finger almost together—to winning its fourth NCAA championship. In the Terriers’ longest ever final four game, they rallied from a three-deficit with less than eight minutes left in the third period, only to fall, 8-7 to Northern Michigan in triple overtime. Like this season’s championship game, it was played in St. Paul. With the loss, not only did the national title elude BU—the preseason top-ranked team; the team also barely missed recording the school's second trifecta—a Beanpot title, conference title and NCAA championship, a feat later accomplished by the 1994-95 and 2008-09 squads. The 90-91 squad set a then-program record for goals in a season with 234—and also gave up the ninth most tallies in BU history, 142—with a roster than included 11 future NHLers, including Shawn McEachern, Tony Amonte, Keith Tkachuk, Ed Ronan, Dave Tomlinson, Dave Sacco and Scott Lachance. Blog contributor mh82 has a produced another masterful chronology, detailing the 1991-92 season from the opener at RPI to the nearly 82-minute finale in St. Paul that ended a fraction of an inch from victory. Ed Carpenter, the Boston University Sports Information Director, reached across his desk to answer the ringing telephone, but when he picked up the receiver, the voice on the line didn’t sound familiar. Perhaps that’s because the caller was a high school teacher hailing from the town of Chicago Heights, located 30 miles south of the City of Big Shoulders. The caller’s reference to “that” game was the 1991 NCAA hockey championship game between the Terriers and Wildcats at the St. Paul Civic Center in Minnesota, the rink that featured clear boards and the venue that once served as the home of the Minnesota Fighting Saints of the defunct World Hockey Association. It was also where Harvard had won its first and only NCAA title two years before, defeating Minnesota in overtime. The BU-NMU game took over four hours to complete (ending past midnight on the East Coast), featured comebacks from three goals down by each team over the final two periods, went to three overtimes and had 88 combined shots on goal. It showcased continual shifts in momentum on the ice, endless swings of emotion on the benches, in the arena and for those watching the dramatic game unfold on television. And finally, there was one euphoric team creating a pile of bodies in celebration on the ice where the winning goal had been scored while the losing squad simply watched in silence, slumped in exhaustion against the boards or mostly motionless on the bench. Rising senior Chris Connolly was named captain of next season's Terriers at last weekend's annual Friends of Boston University Hockey Banquet. No assistant captain were named. Connolly becomes the first Terrier to serve as co-captain during his junior year and captain as a senior since All-American and Olympian Jack O'Callahan in '77-'78 and '78-'79. Rising sophomore Charley Coyle was the recipient of the George C. Carens Award as the Division 1 Rookie of the Year, presented by the New England Hockey Writers Association. BU's schedule for next season has not yet been announced, but one date to mark on the calendar is November 26, the Saturday after Thanksgiving, when BU and Cornell again meet at Madison Square Garden in New York City for Red Hot Hockey III. The previous two games, a BU 6-3 win (video) in 2007, and a 3-3 overtime time in 2009, were both sellouts. A pair of future teammates are squaring off in the USHL playoffs. Last night Cedar Rapids defeated Muskegon, 4-1, in the opener of a best-of-five series with 2011 recruit Cason Hohmann picking up an assist for the Roughriders. Cedar Rapids, which owned the league's best regular season record, had a first-round bye, while the Lumberjacks swept the NTDP U17s in their first round matchup. 2011 recruit Alexx Privitera scored a power play goal in Muskegon's 5-2 clinching win over the U17s. Another future Terrier on Cedar Rapids, 2014 recruit Anthony DeAngelo, is sidelined for the rest of the season with a fractured kneecap. A few weeks back we posted that Privitera's younger brother, Jarrid, has committed to BU for 2012. Some further information on the left-shot forward from his coaches at The Gunnery and the North Jersey Avalanche. Jarrid possesses an excellent skill set that will translate very well to the college game. He is very complete in his ability to be effective in all three zones. His speed, grit, skill, and touch around the net make him a consistent offensive threat (25 goals in 34 games this season). He can play in all situation (PK, PP, 4 v. 4), and his strength allows him to win one on one battles with bigger opponents. He finally possesses outstanding character and always puts the team first. Jarrid has played in our NJ Avalanche AAA program for the last six seasons. He has continued on a steady path of improvement that was a result of consistently being one of the hardest workers and most dedicated player on his team. His low center of gravity and excellent leg strength makes him hard to knock off the puck, despite playing against bigger defense men. Jarrid has a keen sense for offensive opportunity and is a pure goal scorer with breakaway speed. Last but not least, he is team guy, great in the room and has been a pleasure to coach for the last six years. May also coached Alexx Privitera and former Terrier forward Matt Radoslovich when he was NJ Player of the Year at Bergen Catholic. Former Terrier standout defenseman, co-captain, and associate head coach David Quinn is among the finalist for the vacant head coaching job at Providence. Quinn has spent the past two seasons coaching the Colorado Avalanche's AHL affiliate, the Lake Erie Monsters. Four Terriers--Tara Watchorn, Catherine Ward, Jenna Wakefield and Marie-Philip Poulin are representing Canada at the 2011 IIHF World Women's Championship in Zurich and Winterthur, Switzerland. BU has more representatives on the squad than any other team. Poulin, who was named Hockey East Rookie of the Month for March, has three points in three games. Ward and Watchorn has two apiece and Wakefield one. Coach Brian Durocher, whose team reached the national championship game this season, losing to Wisconsin, has lined up three excellent recruits for the 2011-12 season: Defenseman Shannon Stoneburgh of the Toronto Aeros, forward Kayla Tutino of Ontario Hockey Academy and forward Sarah Bayersdorfer (photo) of Morristown-Beard School and the NJ Colonials. Bayersdorfer, coached in high school by former Wisconsin and NHL defenseman Bruce Driver, was a three-time all-state player and two-tim Star-Ledger Player of the Year, but missed her entire senior season due to a knee injury suffered playing soccer. In her three seasons she set a school scoring mark with goals and assists in 60 games. She discussed her recruitment by BU and rehabbing her knee with The Daily Record. BU continues to fill out its recruit classes for future seasons, again reaching into the New England prep hockey ranks for a highly regarded scorer. Cushing Academy’s Rob Baillargeon, a sophomore, who put up a gaudy 30-34-64 line for the Penguins, committed to BU for 2013. According to reliable sources, three Hockey East rivals--New Hampshire, Maine and Northeastern--were also in the hunt for Baillargeon. The 6-0, 174 right-shot forward, played one season for Enfield, Conn., High School in 2008-09, scoring 35 goals and earning First Team All-State recognition. As a repeat freshman at Cushing in 2009-10, he totaled 15 goals and 30 assists. Last summer, he participated in USA Hockey’s Select 17 Festival, scoring seven points, tied for ninth best. 2013 recruit Erne, a power forward and one of the youngest players in the USHL talked with The Scouting Report about his first season with the Indiana Ice and his commitment to BU. NHL Central Scouting issued its final rankings for the 2011 entry draft. Freshman Matt Nieto was #43, while classmates Adam Clendening and Sahir Gill were #45 and #110 respectively. O’Connor was #25 among North American goalies. Another Terrier freshman, Charley Coyle, talked with The Daily Free Press’s Arielle Aronson about his path to BU and how he is "living his dream." Former BU captain Kevin Shattenkirk finished his rookie NHL season with 43 points (9+34), leading all first-year defensemen. His total also was seventh best for all rookies. After 46 games with Colorado—that included a nine-game scoring streak—Shattenkirk was traded to St. Louis in a blockbuster trade. He averaged just under 20 minutes per game for the season. A goal scorer for the Terriers. A goal scorer with a familiar name has committed to BU for 2012 or 2013. Jarrid Privitera, younger brother of 2011 recruit Alex Privitera is completing his junior season at The Gunnery School, where his 25 goals and 18 assists in 31 helped the Highlanders reach the seminfinals of the NEPSIHA smal school playoffs. A Brad Zancanaro-sized, left shot forward at 5-6, 142, the younger Privitera, like Alexx, also played for the North Jersey Avalanche organization, recently participating in the Midget Nationals, Tier 1 U16, scoring 2 goals and an assist in four games. During the 2009-10 season with Avalanche, he had a 27-20-47 in 35 games. 2013 recruit Brendan Collier also participated in the Tier I, U16 tournament and led the Greater Boston Jr. Bruins in scoring with a 2-3-5 line in five games. The Jr. Bruins lost to Shattuck St. Mary’s in the semifinals in double overtime. 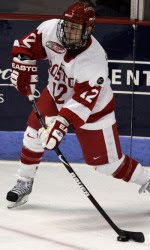 Another member of the Jr. Bruins, Rob Baillargeon, who scored 30 goals and 34 assists as a sophomore at Cushing Academy, earning NEPISHA East first-team honors, recently visited BU, according to a post on the USCHO message board. The commitment for 2012 of Catholic Memorial defenseman Marc Hetnik, Jr. , announced prematurely last month now is official. The defenseman, who scored four goals and 16 assists as the Knight’s captain this season, earned Boston Globe All-Scholastic honors (as did Malden Catholic’s Collier) and played in the Mass. High School All-Star Classic. Hetnik, whose father, Marc Hetnik, played for BU’s 1978 national championship team, will play a year of junior—possibly with BCHL Vernon or USHL Omaha—before joining the Terriers. The Boston Hockey Blog reports that forward Ross Gaudet recently underwent hip surgery. BHB also talked with David Warsofsky about his decision to forego his senior season and turn pro, and completed its post-season review of the Terriers by position: Goaltending; Defense; and • Third and fourth lines. Warsofsky, playing for the AHL Providence Bruins, scored his first pro point and talked with the Boston Globe about his transition to the pros. A USA Hockey magazine feature article looks at Charley Coyle's freshman year. New England Hockey Journal reports on Joe Pereira setting a somewhat dubious record in his first games in the AHL. The Boston Herald reports that former BU associate head coach David Quinn, after two successful seasons leading the AHL Lake Erie Monsters, may be a candidate for NHL positions. But it was another former Terrier, John Hynes, who won the AHL Coach of the Year Award. Hynes, a member of the Terriers’ 1995 national championship team, was in his first season as head coach of the Penguins’ AHL affiliate in Wilkes Barre/Scranton. His squad includes former BU standouts Brian Strait and John Curry.